I consider myself very lucky for a variety of reasons, and one of them is sharing an island with St. George Spirits. For the uninitiated, St. George Spirits became famous for its eau de vie back in the 1980’s, and has occupied a hangar on the decommissioned Alameda Naval Air Station for many years now. Today, St. George is probably more famous for its gin, absinthe and whiskey, but the distillate that really gets me excited is (wait for it) rum! While the vast majority of rum produced here on the mainland is made from molasses, St. George prefers to use fresh-pressed cane juice. St. George Master Distiller, Lance Winters has fermented and distilled just about anything you can imagine (including his own Christmas trees) so it’s not surprising he would take the more difficult path when making rum. It’s this “take the road less traveled” approach and Lance’s unwavering commitment to quality that’s made St. George so successful. Of course he also has a great team behind him, including Distillery Diplomat Andie Ferman, who was kind enough to show me around during the most recent crush. St. George gets its sugar cane from California’s Imperial Valley, which is East of San Diego along the Mexican border. The most recent delivery amounted to a whopping twenty-three tons! St. George runs a pretty spartan operation, so they bring in two shifts of contract workers who work alongside the St. George team for eighteen hours a day to help mill the sugar cane, ensuring the juice is pressed at the peak of freshness. The juice is then fermented, and finally distilled in their hybrid pot/column still. After distillation, the rum is rested in steel for a time prior to proofing (at 43%) and bottling. Around the same time, Lance lays a few barrels down in used French oak, and a lucky few get to enjoy their California Agricole Rum after three or four years of aging. None of the aged rum is currently available for purchase at the distillery, but there are several sources for the unaged agricole, so let’s get some in a glass and take a closer look. 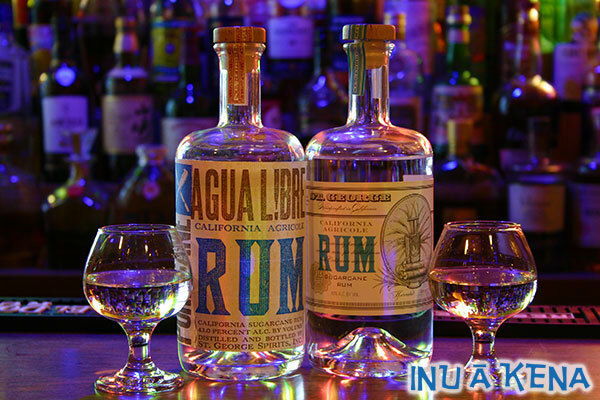 Like all of St. George’s bottles, the California agricole rum arrives in an apothecary style clear glass vessel with a handy neck and synthetic cork with wooden top. While the original expression featured a hand-printed label by the distiller, the label has changed over time to reflect a unification of the brand identity. I personally love the image of the sugar cane as TNT on the new label. The rum enters with a kick of spicy assertiveness. Simultaneously my palate is hit with the sharpness of black and red pepper and the roundness of buttery grass. Once conditioned to the heat, I’m able to again detect the olives and truffles. Underneath the funky vegetal esters lies a layer of sweetness that is reminiscent of a wheat grass shot mixed with a dirty white rum Martini. The finish is long for a white spirit, and as I continue to breathe in, the spice notes dissipate while the warm, buttery grass flavors persist. I realize not everyone is ready for agricole (it can be an acquired taste) but if you’re looking to try one, I would recommend St. George without reservation. (And it goes without saying that if you already enjoy agricoles, you will love this one.) Whereas some agricoles from Martinique and elsewhere in the French West Indies can be a bit too firey for some with aggressive solvent and rubber notes, this California beauty manages to maintain its edge and still go down smoothly. Now bear in mind these notes refer to the spirit itself, so you can imagine how well it works in a ‘Ti Punch–it’s transcendent. If you have the means, I highly recommend picking some up. Josh, and intriguing review, we’ll have to look for this one. I’ve also heard some great things about Sammy’s Beach Bum Rum, also an American cane juice rum that is becoming better known, and more available. A question: you speak of “rubbery and solvent” notes for other cane juice/agricoles. To which are you referring? BTW, our Sue Sea is mad for dirty martinis, so you can be sure that thanks to you, this rum is now on our short list. Transcendent is the perfect word, I think. I just received St. George’s Agricole Rum in an order from Hi-Time Cellars and it blew me away. The aroma was even more assertive than I was expecting, even after reading reviews that called it primal and brazen. I tried it in a Rum and Coke, as one writer from Serious Eats suggested. A simple drink for sure, but it was so good that I started laughing out loud because of how transcendently delicious it was. The savory vegetal flavor was completely present but nicely tamed by the sugary soda. I can’t wait to try other drinks. A dirty white rum martini sounds kind of awesome and I’ve never been excited about martinis before. I’m only worried about how long my bottle will last now! I keep checking back for updates on your amaro experiment. I hope it’s going well!